Welcome to the party! Come in and enjoy! 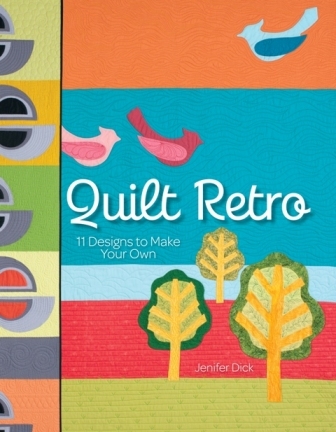 I’m so glad you stopped by to celebrate the release of my third book, Quilt Retro. It’s a fun book full of bright, cheerful quilts and projects that I hope you’ll want to make. Throughout the next two weeks, I’ll show you some of the projects in the book and talk about my thoughts on design, inspiration, quilting, color choices and more. I’ll also introduce you to some wonderful quilters you should get to know if you don’t already! Quilt Retro is decidedly full of quilts and projects with a Modern sensibility, but its roots are planted deeply in the past. As a lover of all things retro, especially the fabrics of the 60s and 70s, I sprinkled the retro vibe throughout the quilts – it may be in its inspiration, color choices or its subject matter, but all these quilts are a contemporary spin on something old! But, what makes Quilt Retro more than a just pattern book is that as you make each quilt, I not only provide the pattern, but give you lots of specific ideas to make each project truly your own. I encourage you to make each quilt a reflection of your personal choices and individuality, not just an exact copy of my quilt. And in turn, I hope you take these ideas with you as you create other quilts from patterns and eventually branch out into designing your own, meaningful quilts! To start off the Launch Party, I’d like to give you a peek at one of my favorite quilts in the book called “Outside My Kitchen Window.” This quilt has very personal meaning for me, but yet has universal appeal! This actually is my husband’s quilt. He is an adamant feeder of birds, so we always have plenty to see looking out the window. One day last year, I counted 22 cardinals feeding and 26 blue jays waiting, not so patiently, up in the trees for their turn. It just struck me how odd all those birds waiting for one small feeder were and I knew the event had to be commemorated in a quilt! As I was designing this, I knew I wanted lots of colors – and not necessarily colors seen in nature. 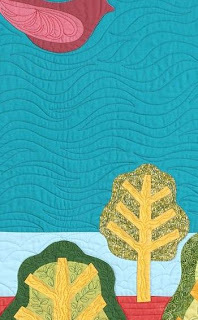 I knew this wouldn’t be a traditional quilt with large open spaces and just a few appliquéd elements. But yet, you can easily get the point – cardinals, blue jays and trees! Let me introduce to you my first guest, Alissa Haight Carlton at Handmade by Alissa. If you’ve never seen her blog before, you’ll be amazed at the beautiful things she creates. While you’re there, check out her finished quilts. If you are unsure of what Modern quilting is, you’ll get an eyeful of great examples there! Alissa will also show you the entire “Outside My Kitchen Window” quilt and tell you how you can win your own autographed copy of Quilt Retro! Tomorrow’s guest: BonnieHunter of Quiltville! Congratulations on the launch of your 3rd book! How exciting!!! Love your sense of color and style! Thank you for sharing your creativity with all of us.